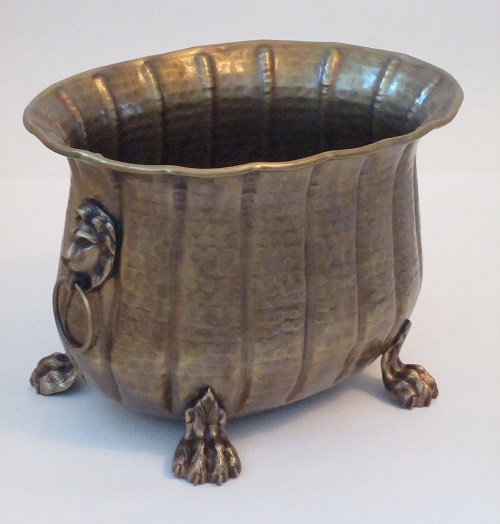 Solid brass oval lion planter tabletop design with cast brass feet and fittings. Lacquered to resist tarnishing. 12.5 x 9.5" (measured across top). 8.5"H overall. Heirloom quality solid brass oval lion planter in antique finish lacquered to resist tarnishing. 12.5" x 9.5" measured across top opening. Interior diameter 9.5" x 7" (midway). Height 8.5" (measured from tabletop to top of rim). Depth of bowl 7." Amazing detail beautifully hand crafted with rugged construction. No drain holes. An Excellent Accents exclusive piece.